MARCO SILVA believes his Everton squad are well-equipped to win at Chelsea, despite their terrible record at Stamford Bridge and their opponent’s imperious recent form. The Blues last won at the Bridge in November 1994, and in order to end this hoodoo tomorrow, they must end new manager Maurizio Sarri’s unbeaten start as Chelsea boss. 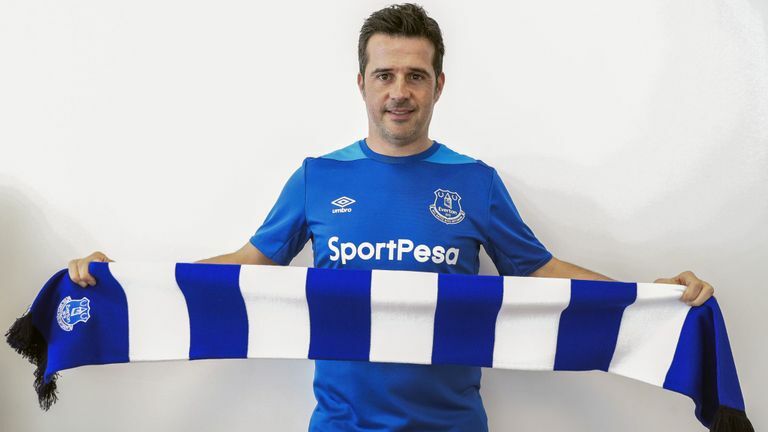 But while Silva is aware that Everton will be unfancied by many this weekend, he is relishing the opportunity to make a huge statement to the rest of the Premier League: “We have confidence in our work and the way we are playing, seeing how our team is growing and getting better and getting results in the last two-and-a-half months. I accept they will be favourites but it is a big challenge for us. “What I hope and expect is that we will be ourselves on the pitch. So far Everton have not won any of their away games against the ‘top six’ since a victory at Manchester United in December 2013, and Silva has already tasted defeat at Old Trafford and away to Arsenal as Blues boss. But, speaking at his pre-match press conference earlier yesterday, he said: “It’s a very good challenge for us. We are improving as a team. We played two away [Arsenal and Manchester United] and challenged them. It’s our way. “Sunday will be a tough match. Chelsea are doing well. They have great individual quality and are doing really well. It’s our goal to compete and take a good result.